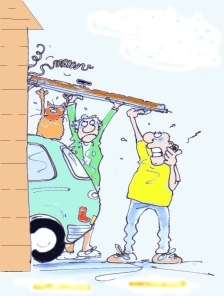 The actual problem starts when the garage door does not work properly. If it is not fixed immediately, the broken garage door makes it very easy for the undesirables and thieves to enter in your home. For this purpose, you need to hire a garage door repair service for fixing the garage door problems as soon as you can. Most people are of the opinion that they are able to perform this job on their own. They might end up doing a lot more harm to the situation than good so it is better to find a reputed garage door repair service for such tasks. But it is important that you hire a company after doing proper research on them. 1. Ask your relatives and friends and get good recommendations regarding the garage door repairing service. This way you can get information on the reliable servicing companies. 2. Looking in the local newspapers, search the telephone directories or visit the websites online for the repairing services of your garage door. 3. Make a shortlist of all the repairing companies and then notice how many of those provide the emergency services as well. A reputable company which provides a nice garage door repair service would have an impressive infrastructure with a number of trained technicians on their team. 4. Be sure that the repair company and all of its technicians hold a proper license with proper skill certificates. They should know how to tackle a situation if something goes wrong. 5. Always select a garage door repairing service which provides full guarantee of their work. 6. It is not always wise to hire an unprofessional repairing service just for the sake of saving money as this decision may cost you a lot in future. The reputation of a company is very important. This article was posted in garage door and tagged garage door, garage door dealer, Garage Door Maintenance, garage door opener, garage door repair, garage door security, garage door technician, garage doors. Bookmark the permalink. I agree that your garage door is an essential part of your home and property. I liked your suggestion to make sure that the repair company makes sure that their employees have the proper license and insurance. I think it’s important to choose a garage door service that can also install a quiet motor so that it doesn’t make a lot of noise.